Introduction: The ideal management strategy for patients presenting late with transposition of great arteries (TGA), intact ventricular septum (IVS), and regressed left ventricle (LV) is not clear. Primary switch, two-stage switch, and Senning operation are the options. Left ventricular retraining prior to arterial switch by ductal stenting may be effective, but the experience is very limited. Methods: Five of six children aged 3-6 months with TGA-IVS and regressed LV underwent recanalization and transcatheter stenting of ductus arteriosus. The ductal stent was removed during arterial switch surgery. Results: The procedure was successful in 5/6 patients. All the patients had totally occluded ductus and needed recanalization with coronary total occlusion hardware. The ductus was dilated and stented with coronary stents. In all the patients, there was significant luminal narrowing despite adequate stent placement and deployment. Two patients needed reintervention for abrupt closure of the stent. Ductal stenting resulted in left ventricular preparedness within 7-14 days. One patient died of progressive sepsis after 14 days of stenting, even though the LV was prepared. Four patients underwent successful uneventful arterial switch surgery. During surgery, it was observed that the mucosal folds of duct were protruding through the struts of the stent in one patient. Conclusions: Ductal stenting is a good alternative strategy for left ventricular retraining in TGA with regressed LV even in patients with occluded ducts. The definitive and preferred treatment of transposition of the great arteries (TGA) is arterial switch operation (ASO). The critical physiologic determinant of anatomic repair in a patient of TGA with intact ventricular septum (IVS) is the functional adequacy of the left ventricle (LV). Traditionally, it has been accepted that the LV can sustain as systemic ventricle up to 21 of days of age in these patients. The ideal management strategy for patients presenting late with TGA, IVS, and regressed LV is not clear. Late primary switch, two-stage switch, , and Senning operation are the options. A few reports of primary ASO up to 185 days of life with acceptable results have been published. Retraining the LV once it has regressed is done by modified Blalock-Taussig shunt and pulmonary artery banding in the two stage ASO. However, the postoperative course is stormy and is associated with a significant interstage morbidity and mortality. Left ventricular retraining by ductal stenting may retrain the LV with less morbidity. Sivakumar et al. have described ductal stenting for TGA in two children aged 3 months with a small patent ductus arteriosus (PDA). We describe five patients older than 3 months with TGA who presented with a closed duct and in whom a ductal recanalization and stenting was done. The study was conducted in a tertiary referral center, All India Institute of Medical Sciences, India. In the late presenters (beyond 3 months of age) with regressed LV, recanalization and stenting of the ductus arteriosus was offered as a way of LV retraining after an informed consent. A detailed echocardiogram was done in all these patients. All the patients had an adequate atrial septal defect. 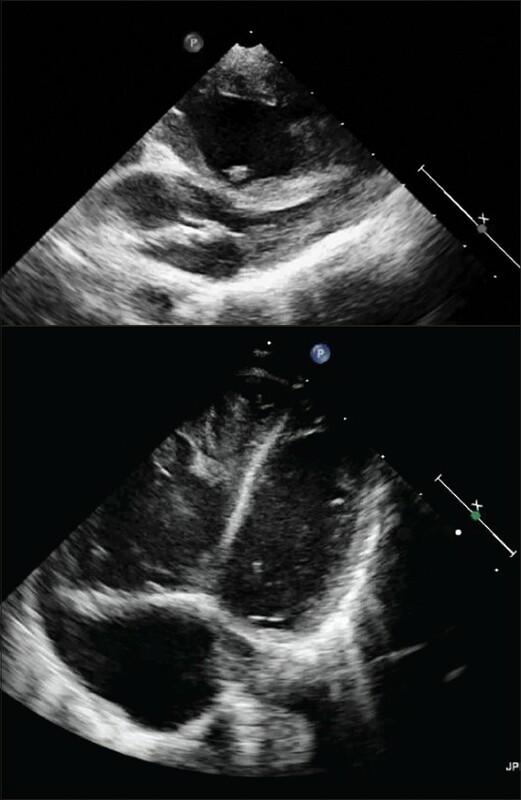 A trickle of ductal flow was seen in one patient. Initially an aortic arch angiogram was done in left anterior oblique and right anterior oblique views to define the anatomy of the duct and ampula. None of the patients had angiographically flowing PDA. A total of six patients (aged 3-6 months) were taken up for ductal recanalization. One patient had no definite angiographically seen ampula or the notch of ductus. Attempts at crossing with multiple coronary guidewires failed, and the procedure was abandoned. This patient underwent ASO with extracorporeal membrane oxygenation (ECMO) support successfully. 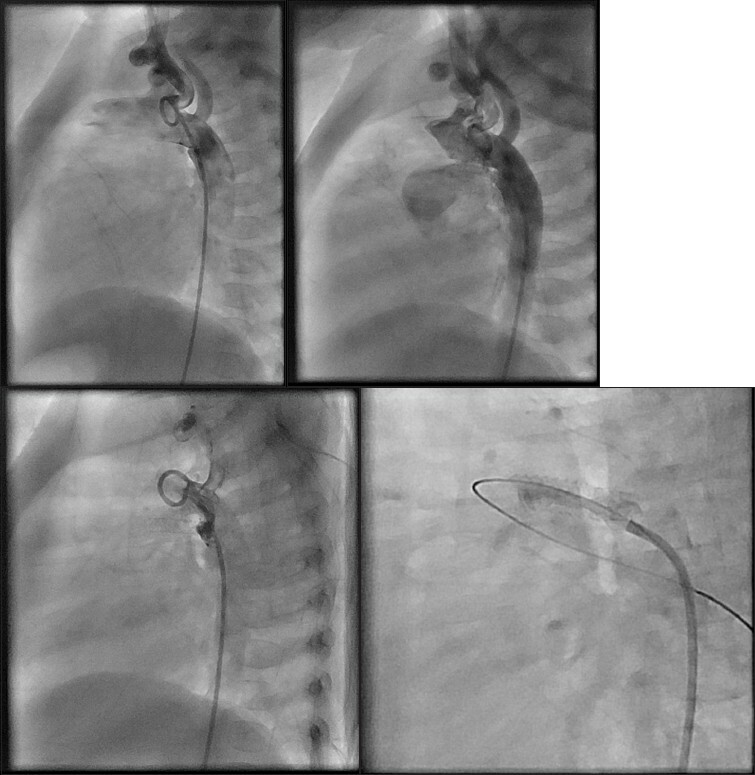 A 4-F JR catheter was commonly used to guide the use of coronary guidewire. In one patient, a cut end of a 4-F pigtail was used. Coronary wires used in crossing chronic total occlusion were used, specifically Crosswire NT, Cross IT 100, 200 and Miracle were the coronary 0.014" wires used. In one patient with echocardiograpic demonstrable trickle of ductal flow, a 0.025" Terumo wire was used to cross the duct. Subsequently, a soft coronary wire was used as a buddy wire and the procedure was continued. In all the cases, the duct was dilated with a coronary balloon (2-2.5 mm in diameter and 12-15 mm length). An angiogram was repeated with the diagnostic catheter with the use of a Tuohy-Borst. Stenting was done with a coronary stent of 3-3.5 mm diameter and 12-24 mm length. An angiogram was done to confirm the stent deployment and flow across the PDA. In the last patient, elective dilatation with a noncompliant coronary balloon was done. All these patients were given dual antiplatelets (aspirin and clopidogrel) after stenting and heparin 100 m/kg bolus followed by 10-12 U/kg/h infusion for at least 24 hours. One patient developed hypotension, bradycardia, and shock immediately after the procedure. Echocardiography showed a blocked PDA with an adequate ASD, and there was no evidence of cardiac tamponade. Repeat femoral puncture was obtained with difficulty, and the occluded ductal stent was recanalized and dilated with a noncompliant balloon. The patient was revived and was extubated 2 days later. The LV was successfully retrained, but the patient succumbed to acinitobacter sepsis on day 14 of the procedure. Another patient developed dissection in the ampula. As the patient remained hemodynamically stable and the dissection flap was retrograde, it was thought that ductal stenting may seal it. A BxSONIC (3 × 24 mm) stent was deployed appropriately inside the duct. The patient underwent successful ASO. In third patient following a successful stent deployment [Figure 1]a and b, the ductal flow across the stent significantly decreased after 12 h of the procedure. A possibility of stent thrombosis was considered and was continued on IV heparin. He needed IV streptokinase for absent femoral pulses and the lower limb pulses reappeared in 20 hours. Still the flow across the ductal stent was minimal. Hence, block due to intrusion of mucosal folds into the duct through the struts of the stents was suspected. Because there was no significant improvement with a 24 trial of streptokinase, the patient was taken up for catheterization study. An aortic angiogram done revealed a blocked ductal stent [Figure 1]c. This time the duct was crossed with a 0.014" BMW guidewire. A voyager balloon was again used to dilate the occluded ductal stent. After two dilatations, a good flow was established [Figure 1]d. Later he was observed in the ward for a few days and was sent for ASO. Intraoperatively, it was found that there was no thrombus in the stent, and the mucosal folds of the duct were intruding into the stent through the struts. The stent was cut and removed. Out of the six patients, five had successful recanalization and stenting of the ductus. Two patients needed a repeat intervention because of blocked PDA stent. In all the patients with successful PDA stenting, the LV mass index, LV dimensions, and posterior wall thickness improved significantly within 7-10 days [Figure 2]a and b. All the patients tolerated the acute opening of the duct well. The patients were treated with diuretics and dobutamine as the clinical situation demanded. The timing of ASO was empirically decided when the LV appeared prepared on echocardiography to the naked eye based on the LV volume and the septal movement. Four patients underwent successful ASO at 10-14 days interval. The stent could be removed without any difficulty during surgery. Our study shows that ductal recanalization and stenting is technically feasible and is effective in retraining the LV in late presenters with TGA and IVS. This technique is especially relevant in our country, where a substantial number of patients with TGA present late. In our center, primary late ASO with ECMO support is emerging as the treatment of choice in late presenters with TGA IVS. Ductal stenting may be particularly useful in centers where ECMO support and expertise are not available. Ductal stenting significantly enhanced the safety of late ASO. Ductal stenting in TGA with IVS was first reported by Sivakumar et al. in 2006. He described successful ductal stenting and subsequent ASO in two children aged 3 months and both had a flowing PDA. We extended this technique to children beyond 3 months of age and to patients with an occluded duct. The basic principle behind the ductal stenting in TGA with IVS is the retraining of LV, so that it can adapt for a higher systemic resistance of the body following ASO. With a small untrained LV, LV cannot tolerate sudden increase in its afterload leading to heart failure and shock. Hence, assessment of LV status is mandatory before sending a patient for ASO. The rapid training of LV by doing a BT shunt and PA banding is an accepted modality for the same. , However, this strategy is associated with a higher interval mortality and morbidity. Thus, ductal stenting may be a useful alternative strategy for LV retraining. The increase in LV dimensions and LV mass matches the results of ductal stenting reported earlier. In the earlier report of ductal stenting, the indexed left ventricular mass increased from 18.9 to 108.5 g/m 2 , left ventricular free wall thickness from 2.5 to 4.8 mm, and indexed left ventricular volumes from 7.6 to 29.5 ml/m 2 within 3 weeks. We observed similar impressive changes occurring within days and the LV gets retrained within few days of ductal stenting. Recanalization of an occluded duct resulted in increased risk of reocclusion, which was clinically and hemodynamically life threatening. This may be because of protrusion of mucosal folds into recanalized duct through coronary stents, which we did not anticipate. In the initial cases, we thought it may be ductal thrombosis and incomplete coverage of duct with stent. The protrusion of mucosal folds was confirmed on the operating table in one patient. With careful monitoring, all reoccluded ducts could be successfully redilated. This complication can possibly be overcome by use of a stent with higher radial strength, post dilatation with a noncompliant balloon at higher pressures, or the use of covered stents. This experience and improving coronary total occlusion hardware should further minimize the complication rate with this strategy. Many clinicians consider ASO preferable to Senning operation in late presenters with TGA and regressed LV. Hence, various surgical and interventional modalities have been tried to train the LV. However, almost all these approaches are associated with significant increase the mortality and morbidity. The best treatment for patient of TGA IVS presenting beyond 3 months remains unclear, and perhaps best guided by local experience and patient factors. The patients represent a selected group of late presenters with TGA. Thus, the indication of ductal stenting remains unclear. Further, the time course of changes in LV volumes and mass index were not systematically studied and this offers an opportunity for further studies. How this strategy compares with the primary switch with or without the use of ECMO for late presenters with TGA IVS is not known. Our preliminary experience suggests that ductal stenting is a useful alternative. Ductal recanalization and stenting in late presenters with TGA and IVS successfully retrains the LV and enables safe late arterial switch surgery. Further experience is required to reduce the reinterventions. 1. Nicholas TK, Blackstone EH, Doty DB, Hanley FL, Karp RB. Kirklin/Baratt-Boyes Cardiac Surgery. Philadelphia: Churchill Livingstone; 2003. p. 1438-507. 2. Kramer HH, Scheewe J, Fischer G, Uebing A, Harding P, Schmiel F, et al. Long term follow-up of left ventricular performance and size of the great arteries before and after one- and two-stage arterial switch operation of simple transposition. Eur J Cardiothorac Surg 2003;24:898-905. 3. Sharma R, Bhan A, Choudhary SK, Kumar RP, Juneja R, Kothari SS, et al. Ten-year experience with the arterial switch operation. Indian Heart J 2002;54:681-6. 4. Kang N, de Leval MR, Elliott M, Tsang V, Kocyildirim E, Sehic I, et al. Extending the boundaries of the primary arterial switch operation in patients with transposition of the great arteries and intact ventricular septum. Circulation 2004;110(11 Suppl 1):II123-7. 5. Sivakumar K, Francis E, Krishnan P, Shahani J. Ductal stenting retrains the left ventricle in transposition of great arteries with intact ventricular septum. J Thorac Cardiovasc Surg 2006;132:1081-6. 6. AK, Sharma P, Chauhan S, Reddy SM, Das S, Saxena A, et al. Primary arterial switch operation in children presenting late with d-transposition of great arteries and intact ventricular septum. When is it too late for a primary arterial switch operation? Eur J Cardiothorac Surg 2010;38:707-13.